Parkies is a game by JT Smith and Jamie Vrbsky, published by The Gamecrafter, LLC. It is for 2-6 players. In this game, players take on the role of theme park entrepreneurs. They’ll work to build the best theme park possible while attempting to attract Parkies of all types. They’ll have to use some shrewd business skills and some great planning to get the most from their park. In the end the player that can build the biggest and best park will be declared the winner. To begin, the bidding mat is placed in the center of the play area. The Parkies are placed near the bidding mat. The small attraction tiles are shuffled and placed face down on the indicated spot at the edge of the mat. The same is done with the medium and major attraction tiles. Each player is given a player mat and reference tile. Players should place their mat in front of them with the lake side face down. Players choose a color and receive the bidding pawn, money marker disc and track marker cubes of that color. The 3 track marker cubes are placed in the number 5 position of the allure, profitability and satisfaction tracks on the player’s mat. Each player’s money disc is placed on the 20 spot of the money track located on the bidding mat. Depending on the number of players, some of the attraction spaces should be covered with leftover reference tiles. The first player is chosen and they receive the first player pawn. Play now begins. The game is played over several rounds. Each round is divided into 7 steps. The first step is to flip over new tiles. To do this the first player will flip over attraction tiles to fill any empty spaces on the bidding mat. In later rounds, any leftover tiles will shift to the right making them cheaper to bid on. Empty spaces are then filled like normal. The next step is to place bids. Starting with the first player, each player will place their bidding pawn on a bidding space beside one of the attraction tiles. Players can only bid as much as the money they have. This continues in turn order with players placing their bids. If a player is outbid, they can then move their bidding pawn to a different valid location. This continues until there are no more bidding possibilities. Players may also place their bidding pawn on the Parkie Pool. The third step is to pay, place and adjust. In this step, players pay for the tile they won by moving their disc on the money track. They then place their tile in their park. Attraction tiles must be placed so that a direct path may be drawn back to an entrance. It should also be noted that they’re not allowed to dead end to each other. Once the tile is placed, the player then adjusts their allure, profitability and satisfaction based on the values of the tile that was just placed. If a player had placed their bidding pawn in the Parkie Pool, they add 3 money to their money track and take a Parkie of any color from the pool. The Parkie is then placed on an entrance tile attraction. The next step is to collect income. Players in this step will now collect income based on the lowest value between their allure, profitability and satisfaction. They will now move their money tracker disc up by this amount. The fifth step is to move Parkies. This step is only used in later rounds. This step allows the player to move a Parkie up to two spaces, or move 2 Parkies one space each. The next step is to pick Parkies. Starting with the first player, each player will now pick a Parkie from the pool that matches the color of one of the flags on an attraction tile in their park. If a player doesn’t have any attraction tiles, then they are not allowed to pick a Parkie. Just like before, the Parkie is placed on an entrance tile. The final step is to pass the first player marker. The first player now passes the pawn to the player on their left. At this point, a new round begins starting with the first step. There are a couple of things that should be noted. If a player doesn’t have room for a new attraction tile or simply decides that they don’t want a particular tile anymore, they may demolish it at any time as a free action. If there are any Parkies on the attraction, they are returned to the pool. The player then gains 5 money for each Parkie discarded in this way. The demolished attraction tile is then placed at the bottom of the corresponding pile. Other items of note are Parkie powers. Parkies have 3 power. First off they offer a 2 money discount when making bids on attractions that match their color type. Parkies can be discarded to gain 5 money instantly. Of course if that money is being used to bid, the Parkie must be discarded before the bid is placed. Parkies can also be used to trump a bid. To do this, the player places a Parkie that matches the attraction color on top of the tile that is being bid on. They then place their bid marker on the top bidding spot, returning another player’s marker if there is one there. Once bidding has ended, the Parkie is returned to the Parkie Pool. The game continues until at least one player is able to connect all 4 of their entrances to each other. When this happens, the current round is completed and scoring begins. Another way the game can end is if 2 piles of tiles and their bidding locations are empty. Scoring occurs in the same way. To score, each player places their bidding marker on the 0 position of the money track, using it to add up their score. 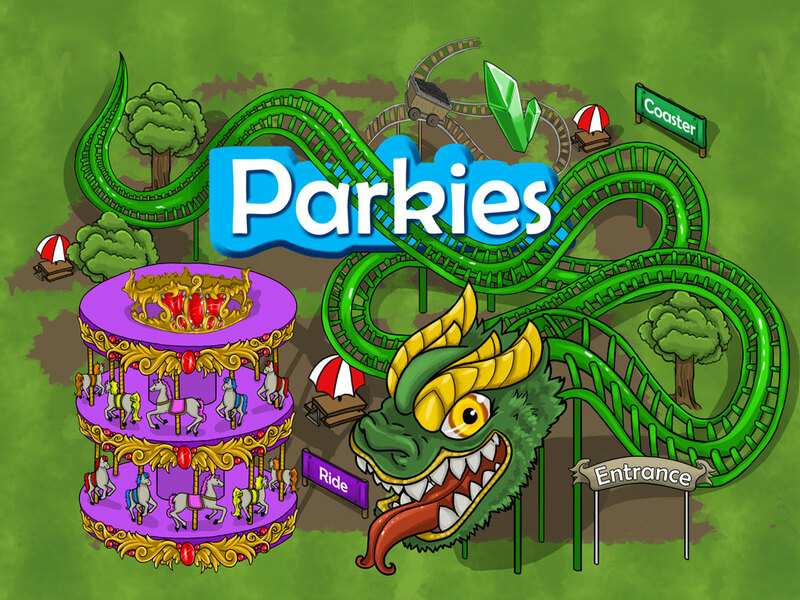 Players gain money for any Parkies still in their park. They then gain points for each heart that is passed on the track. Players also earn points for each unique attraction type in their park. They gain points for each attraction with a matching colored Parkie. They also earn points for each attraction with a heart on it. They gain points for each heart that has been passed on their allure, profitability and satisfaction tracks. Finally they earn points for each entrance that has been connected to each other. Players then add up their points. The player with the most points is the winner. This game looks great. Just looking at it reminds me of the old Roller Coaster Tycoon computer game. I’ll be honest it was this look that drew me to the game. The attraction tiles have a very similar Roller Coaster Tycoon look and feel to them. They’re thick cardboard and they look awesome. I absolutely love the artwork for them. There’s lots of wood in this game and I’m not talking about the coasters. There are bidding pawns, track markers, money markers, Parkies and the first player pawn. That’s a lot for one game. Each wooden piece is brightly colored and looks great. I especially like the Parkie meeples. About the only disappointing part to this game are the player mats and the bidding mat. While they look nice and are designed really well, unfortunately they are made of very thin cardboard. Personally I wish they’d been thicker. As it is, they don’t exactly want to lay flat on the table so you wind up with at bulge in the middle of your mats. That is at least until you get some tiles laid out on them. Overall they aren’t bad, just not as good as the rest of the pieces. Even so, the components are still pretty darn nice. I’m not gonna complain too much about them. The rulebook for this game is quite nice. There are lots of great pictures throughout the book. Also included is a really nice 2 page example of play that goes through most of what you should expect when playing the game. The rulebook also has special rules for playing the game with 2 players, which I didn’t cover in the overview above. Just know that the rules are a little bit different when playing with 2 players. I’m actually glad these are there as I find myself playing a lot of 2 player games. The book also includes the Lake variant which uses the back side of the player mat. This is for more advanced play, making the game a bit more challenging and longer lasting. The rules also have a short strategy guide with some helpful hints on getting the most out of your game. I have to say that the rules are well written with everything look really good. I really like the overall design. It’s easy to read without any problems. Great job. For a game about building a theme park, this is one of the best. I really enjoy this one. I like bidding on attraction. I like that sometimes you’ll outguess your opponents and sometimes you’ll outguess yourself, winding up pay too much. I like that the game feels really balanced. There’s not those runaway leaders like in so many other games. I like how it has that Roller Coaster Tycoon feel to it, as you try to place the best attractions in the best possible way to attract the right customers. Thematically I love how the game feels. Unlike games such as Steam Park, I like the turn based aspect of the game. It has a great worker placement type feel without throwing too much at you at one time. One of the major scoring opportunities I found was in diversifying your attractions. If you can try to always get a different type of attraction, you can wind up with a lot of points at game’s end. Connecting entrances is also a must. If you can get all 4 you’re well on your way to victory. Don’t be afraid to demolish attractions either. Sometimes you just can’t get things to work out the way you want so to make room for bigger stuff, you might need to destroy an attraction or two. To me this really felt great and I enjoyed it immensely. Fans of games like Castles of Mad King Ludwig might enjoy the building aspects of the game, while fans of Steam Park should enjoy the thematic elements. This is a game that I’d highly recommend, especially if you enjoyed Roller Coaster Tycoon like I did. This is a ton of fun and one that I look forward to playing a lot more of. Parkies is a bidding and building game with a theme park creator feel to it. It’s not a very long game to play. Most games sessions last a little longer than an hour. The game looks really great. I especially like the attraction tiles. They give me a great feeling of the old Roller Coaster Tycoon computer game. Unfortunately, the bidding and player mats are a bit thinner than I wish they were. They don’t lay flat on the table which is a minor inconvenience. The game is a lot of fun. I really like building up my theme park and seeing the ending results. In some ways it feels like Suburbia or even more like Castles of Mad King Ludwig through the tile laying and building aspects of the game. Fans of these games should really enjoy this one as well. It should also appeal to fans of theme park games like Alan’s Adventureland or Steam Park. There’s quite a bit of replayability with the advanced game play of the Lake variant. Overall I’m really happy with this one. I would highly recommend it. It’s coaster enthusiast approved. For more information about this and other great games, please check out the Gamecrafter at their site. This entry was posted in Reviews and tagged board, board games, card, card games, game crafter, gamecrafter, games, jamie, jamie vrbsky, jt, jt smith, parkies, smith, vrbsky. Bookmark the permalink. Thanks for the review. I AM a fan of both the board games mentioned and the old Rollercoaster Tycoon so this seems right up my alley. It doesn’t look like it’s available too many places though. Unfortunately the only place I know where to find it is the Game Crafter website.